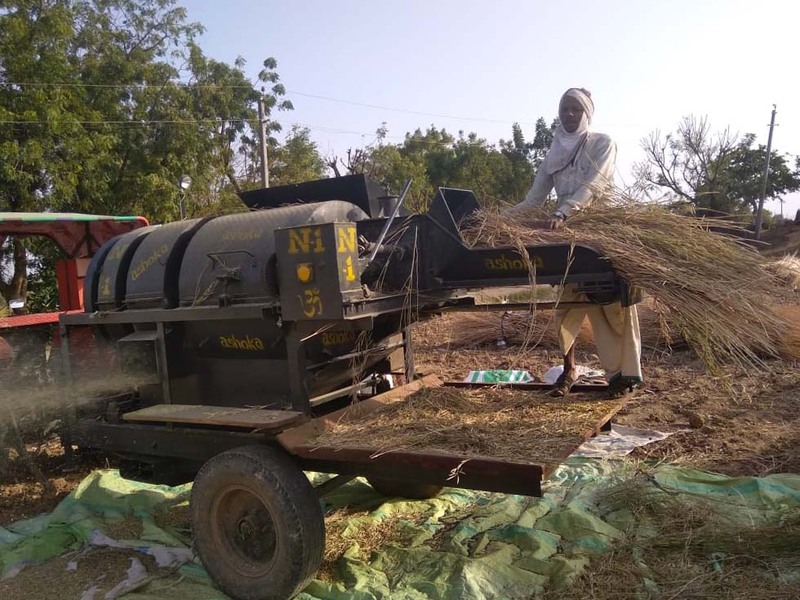 The first two-acre organically grown mustard crop is being harvested in the village of Harirampura. Not only is this a farmers’ group venture; the farmers’ families have become enthusiastically involved. “After ploughing and amending the soil with Chyawanprash and cow dung as a manure, the seeds were planted on December 15,” Rajesh Meena, the village coordinator and one of the farmers, explains. Following this, the farmers’ families watered until the first flowers appeared and then weeding regularly. The harvest itself involved separating the seeds with a thresher, which were then dried and cleaned. This crop will be extracted to mustard oil, which is in high demand in northern India. But Rajesh predicts an even higher return than the normal government rate of 4200rs for this organically cultivated crop. With the demand for organically grown vegetables and oils growing among devotees, farmers and their families have every reason to expect a lucrative first yield. Harirampura farmers have organized themselves as a group with its own bank account. With farmer group registration expected to be completed after March, government schemes and subsidies for tractor and other farming equipment rentals will become available. There are also selling advantages for registered farmers’ groups. Not only does the buyer come to the registered farmers’ homes, but the crop can be more easily sold at the market. As in previous year, the MA Math in Delhi is offering a helping hand with the sale of the village crops.